Puerto Limon's practical transportation options are limited to buses, shuttle flights from San Jose and taxi travel, unless a car is hired in San Jose for the duration of your holiday. Modern bus transport runs in from San Jose, which is a two- to three-hour journey. Buses also leave from Puerto Limon and travel to towns along the Caribbean coast. Passengers should be careful of their belongings on crowded buses, as thefts do occur. The tourist minibuses are generally safer, although not as comfortable. 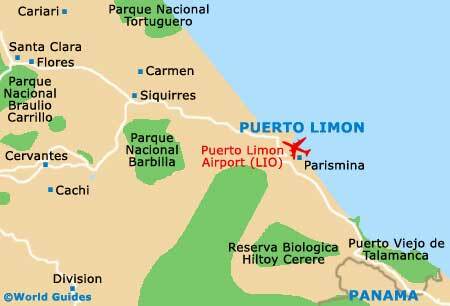 The city's closest airport is Puerto Limon Airport, more an airstrip than an airport and located at the edge of the city, just 4 km / 2.5 miles to the south. Closed for 20 years, this airport reopened in 2006 and now provides flights to San Jose and several other Costa Rican cities by local carriers Nature Air, Sansa, Aerobell and Paradise Air, although Sansa's flights to San Jose are charters on request only. Ground transportation from the airport is by either hotel shuttle and by taxi. Just one car rental company, Poas - a Costa Rican operation, services the southern Caribbean coastal area. Their office is located in Puerto Viejo de Talamanca. If self-drive is a must, then renting a car in San Jose and driving to Puerto Limon is the only option. This journey takes just under three hours. Do bear in mind that the city of Puerto Limon currently only has one gas station and this is to be found on the southerly coastline, a short distance to the north of Cahuita. Book your Puerto Limon Car Rental here. Buses leave from downtown San Jose on a regular timetable to almost everywhere in the country, including Puerto Limon. Most are direct and comfortable, but can get very crowded at weekends. Tourist minibuses are also available and are safer as regards thievery, but luggage must be strapped on the roof, even during the rainy season. In Puerto Limon, local buses run to many destinations on the coast, but are ex-US school buses and so may not be comfortable for extended travel. The city's bus station is named the Terminal Caribeno and is to be found on the Avenida 2, between Calle 7 and Calle 8. Buses departing from here connect onward destinations such as Guapile, Moin, San Jose and Siquirres. Taxis are available in the city, for both short and long journeys. However, it is advisable to agree a price before you actually get in, as meters are often either not working or not switched on. It is worth noting that travelling alone at night is not recommended, since there are some areas of the city, especially near the port, where street gangs, drugs and prostitution pose a serious problem. A few boats dock at Puerto Limon and provide transportation to Tortuguero, Puerto Viejo and Cahuito, as well as tourist trips and pleasure cruises to offshore islands. More information about San Jose travel and transport.